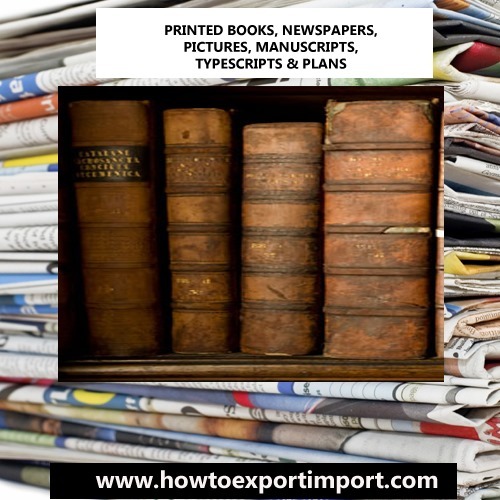 In this article, the Harmonized System codes (Harmonized Tariff System- HTS) for Printed books, newspapers, Pictures, MANUSCRIPTS, TYPESCRIPTS and PLANS are mentioned which help you in exporting and importing of Printed books, newspapers, Pictures, MANUSCRIPTS, TYPESCRIPTS and PLANS. These codes help exporters and importer all over world to know product classification code named differently in each country like Schedule B, ITC, HS, HTS, Tariff Code etc. 4909 printed or illust post cards, greeting cards, etc. ravi trivedi: On 30 September 2015 i want to export paper bag in different king of paper. so what should be my HS code and say about how i export with duty free and by exporting that i want to get benefit of drawback. Aneesh: On 19 March 2017 Hi, i am an author and di biographies. I need to export books of canadian indians to them only. Do i need an export licensce for that?